ingredients together except for the mushrooms. What’s special about this recipe? 1. This is a great gluten-free appetizer you can make for your holiday entertaining. 2. Phytonutrients found in cancer have been the subject of anti-cancer research. 3. 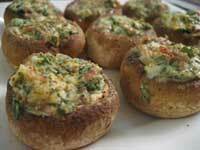 Mushrooms are high in vitamins B2, B5 and B3 as well as selenium and copper and zinc. 4. Mushrooms may help prevent breast cancer by preventing circulating levels of estrogen from becoming excessive. 5. Mushrooms contain a powerful antioxidant, l-ergothioneine.